I got extremely productive in the last couple of days! Mostly knitting lots of tubes. 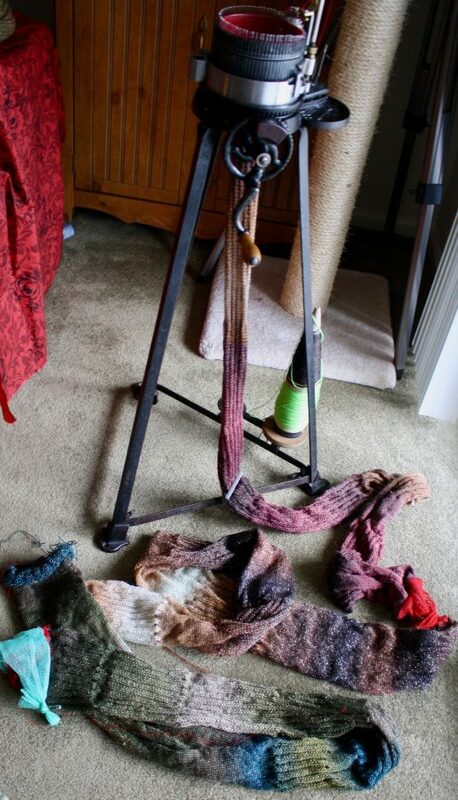 My first few attempts at infinity scarves on the Circular Sock Machine were successful enough that I decide to have a day of mass production. 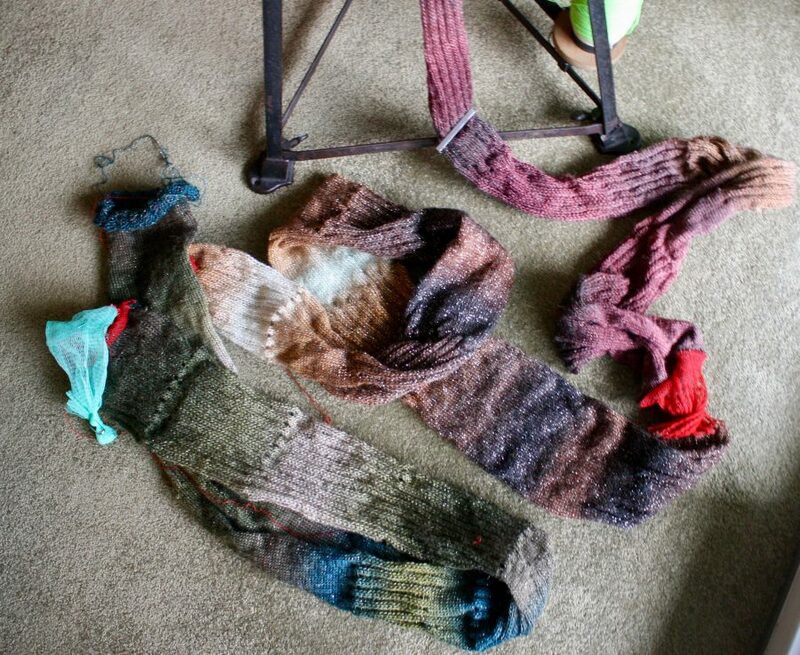 This pile of tubular knitting will be massaged, grafted and woven in to hopefully produce three of these beauties. 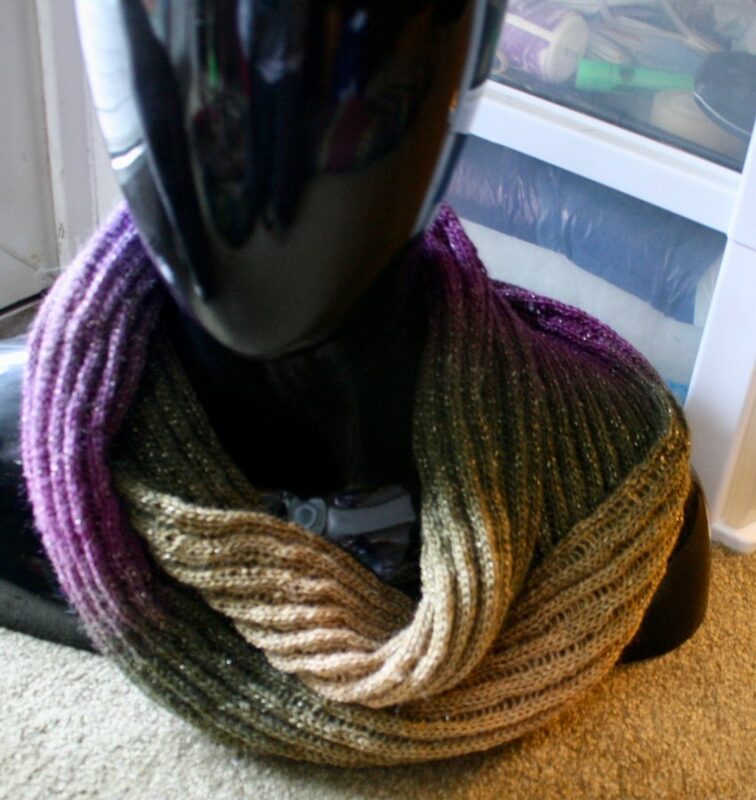 When I found the label for the yarn that I used to create this infinity scarf, I decided to order three more balls of it. They yarn is Nako Arya Ebruli Sim (Glitz) Yarn. I got a good deal on these three balls, so with a few hours of cranking, grafting and weaving, I should be able to sell these sparkly scarves at the end of the year at my craft shows. 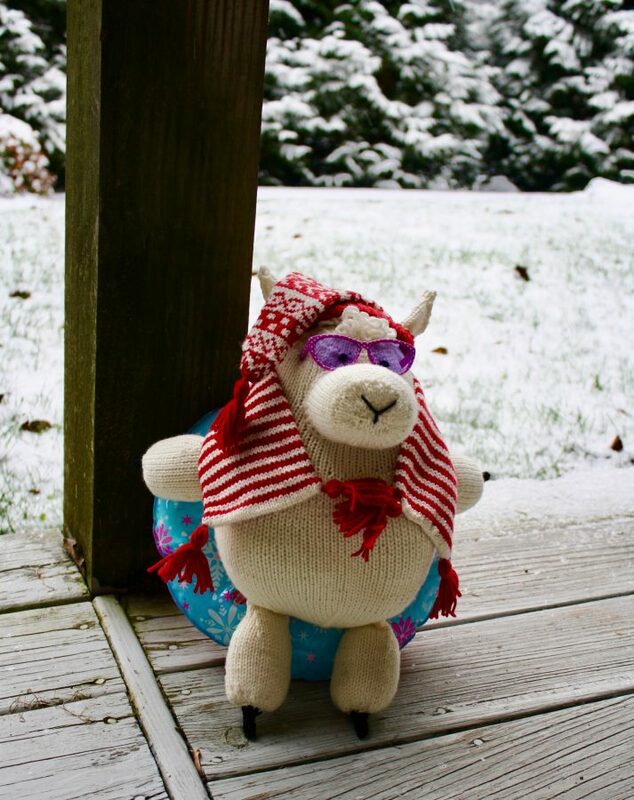 While I wasn’t able to use the CSM for Dolores snow sledding scarf (yes, it’s a tube of knitting), I did finally commit to finishing her Winter outfit. 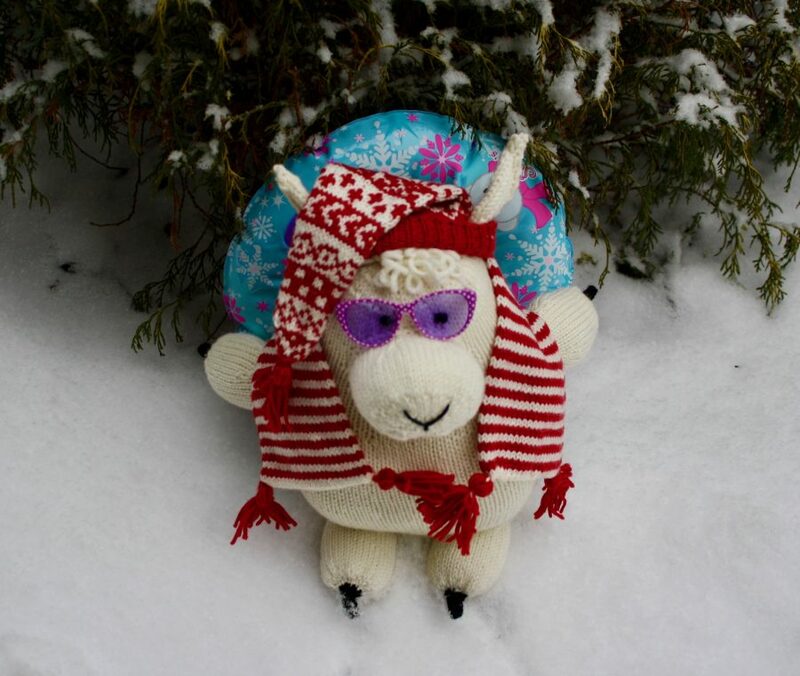 Fortunately, it was just in time for the snowfall. I do have to say that the hat for this outfit was a lot of fun, and the scarf was the most boring project I’ve completed in a long time. 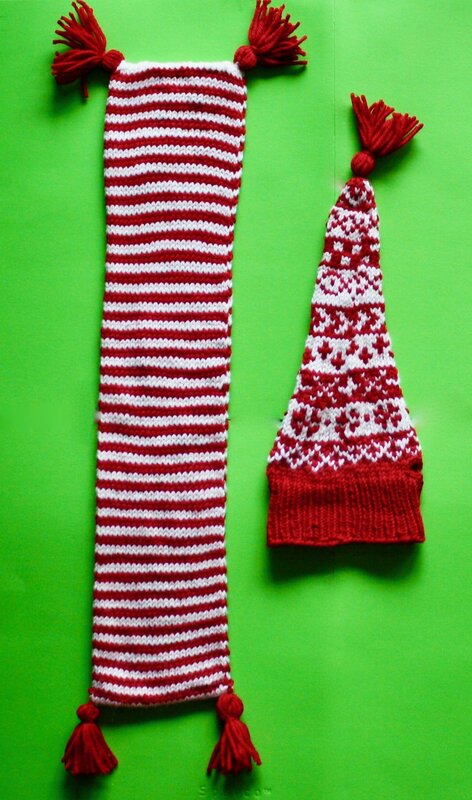 I would most like do a double-knitted scarf instead if I ever decided she needed a second outfit for snow sledding. Yes, in addition to all the tubes for scarves, I also completed the body tube of my Briyoke sweater! 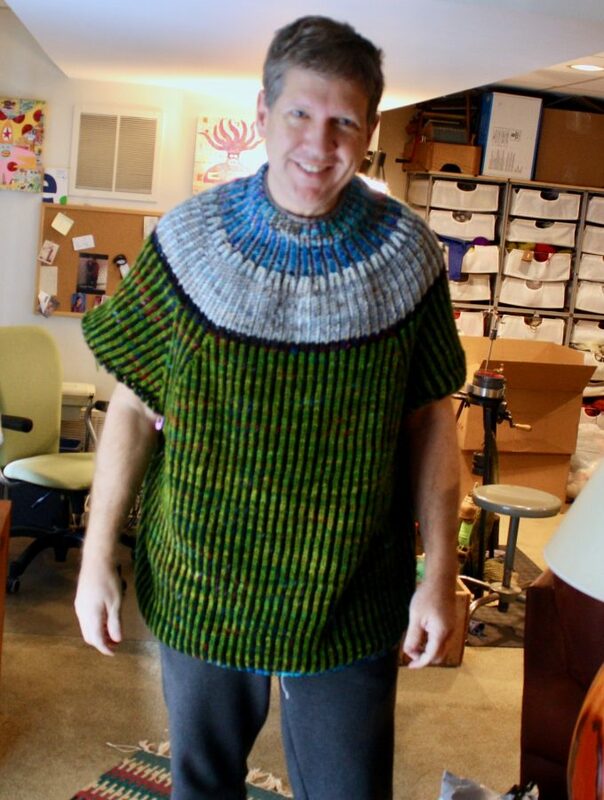 Sorry for the lousy photo…I find it difficult to take full-torso selfies, so I end up settling for the least bad photo I take of myself and sweater. Briyoke is a very roomy sweater. I’m hopeful that it will fit Thaddeus and that he will like it well enough to wear it. Now it’s on to the sleeves! Go Thaddeus! The sweetlooks great. You won’t need a coat outside with a sweater this warm, nor would I like to cover such a beautiful sweater such as this under a coat.